Unlike other two-wire systems, Rain Master’s TWICE protocol provides a two-way communication link between the controller, decoders and valves. This provides the means for testing and diagnostic capabilities within the two-wire path. The simplicity of the two-wire field installation, coupled with the enhanced capability of Rain Master’s ‘E’ series controllers, sets a new precedent for "Two-Wire" control within the irrigation industry. The TWICE Two Wire Interface Module; TWICE is compatible with the Sentar II and Eagle / Eagle-i controllers. Two-way communication Decoders insure system integrity between the TWICE module and irrigation valves. 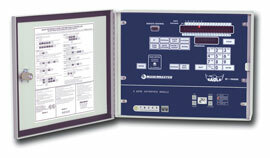 2-year Limited Warranty on TWICE module: In addition to Rain Master’s standard trade warranty against workmanship, the proper installation and grounding of all components as stated in the instruction manual and the use of NEC approved waterproof wire connection devices must be adhered to or warranty is void.